Josie intently watching for ducks. 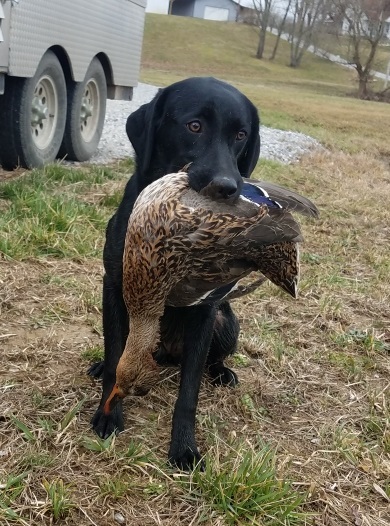 Indie on a SE Missouri duck hunt. Asia getting some big air! Carly, waiting for some action in the timber. Barbie perfecting "hold" with the real thing. 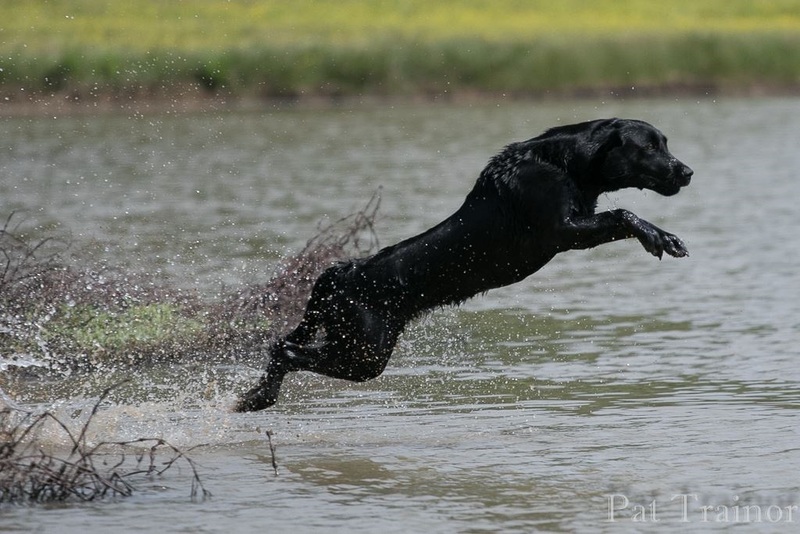 Unlike the majority of other Labrador Retriever breeders, all of our dogs pick up on a commercial waterfowl club and compete in sanctioned hunt tests. We'll be happy to do a field demo with any of our adult breeding dogs, using hunt test or simulated hunting scenarios. We challenge you to find another Labrador Retriever breeder that can boast of these credentials. As outstanding as they may be, we refuse to rest on the laurels of our pedigrees. We know that a FTC, five generations back, will only carry so much influence (if any) on your puppy. This is why we place so much emphasis on the known qualities of our own breeding stock, instead of simply applauding the achievments of dogs from a decade or more in the past. I consider very few kennels that sell pups to fall under the "breeder" catagory. The vast majority simply produce pups, for sale to the general public. Our goal is to continually improve the Labrador Retriever breed, and our matings are determined with this improvement in mind. The physical & genetic health of our dogs (and their offspring) are of paramount importance to us. After the age of two years, we have hips & elbows x-rayed and submitted to the OFA for grading. Only dogs with a minimum of a "Good" hip score will be bred. We also have our dogs examined by a Canine Ophthalmologist for signs of cataracts at several times throughout their lives. Only those dogs with a passing "CERF" will be used in our breeding program. Many other Labrador Retriever breeders will only do one "CERF" at a young age, when cataracts are unlikely to be present. Lastly, we do DNA testing for EIC (Exercise Induced Collapse), PRA (Progressive Retinal Atrophy), and CNM (Centronuclear Myopathy). Because of our stringent health requirements, we can offer our puppy customers a 30-month health guarantee that is second to none! Josie's our matriarch, and such an big part of the family. She entertains our nieces and nephews, helps teach the puppies to swim, and is the "front-seat" travel companion. If you see our truck with a Black dog in the front, you can bet it's Josie. 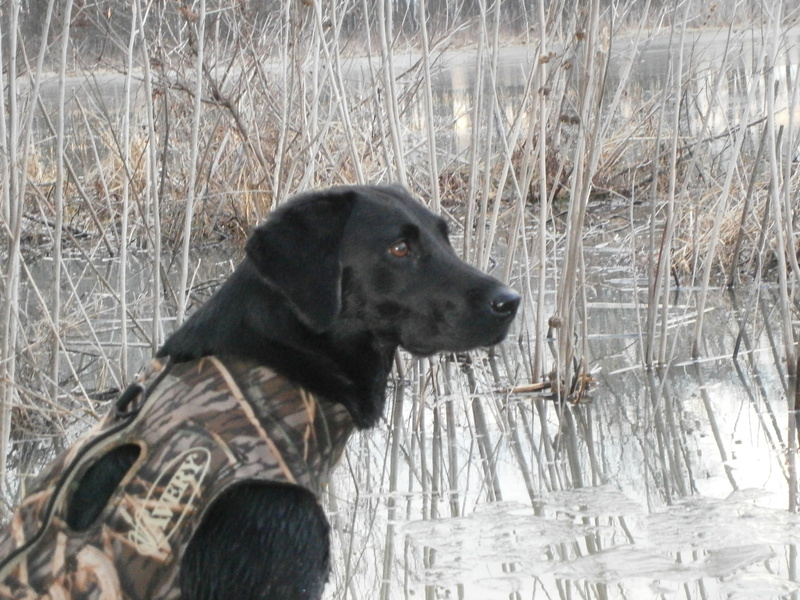 Besides all of these things, she's an intense & tough waterfowl veteran whose retrieves easily number in the thousands. Wish I had ten more just like her! "She's not just a pretty face" is our favorite description of Indie. Yes, she's a stunning girl, but there's so much more to her than just looks. She's tough and dependable, stylish, and bold. She's also a willing "team-player", a quality often overlooked by other Labrador Retriever breeders. She has all of the characteristics that I desire in a working retriever, and the "pretty face" doesn't hurt! She passes on her qualities to her offspring, as we have seen in several of her pups. To top it off, Indie is an HRC Hunting Retriever Champion. She truly is the complete package! Intense...that's the one word that best describes Molly. She was purchased as a pup to eventually sell as a Started Retriever, but we were so impressed that we decided to keep her for our breeding program. 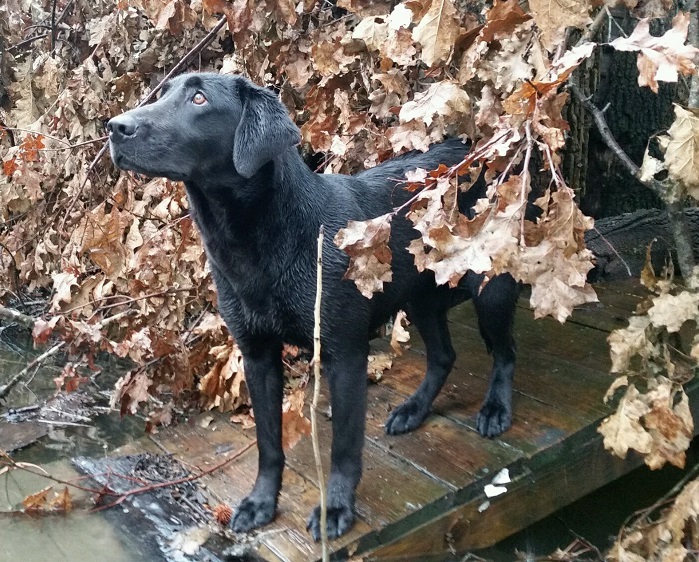 She achieved her HR title at 18 months, and has become a dependable and tough working retriever. Her high point of the 2014 waterfowl season was a 250 yard blind retrieve, transitioning between water and land twice. She flat-out loves picking up birds. Molly will begin running HRC Finished tests in the fall of 2015, in pursuit of her Hunting Retriever Champion title. Some dogs are just a pleasure to work with, and I would certainly consider Asia to be one. She's extremely quiet and reserved, but with a definite sense of humor. She learns new training concepts very quickly, and seldom needs prolonged repetition. Like Indie, she is very stylish and willing to please. She's calm, steady and quiet in the blind, but hits the water hard when it's her turn to get the bird. 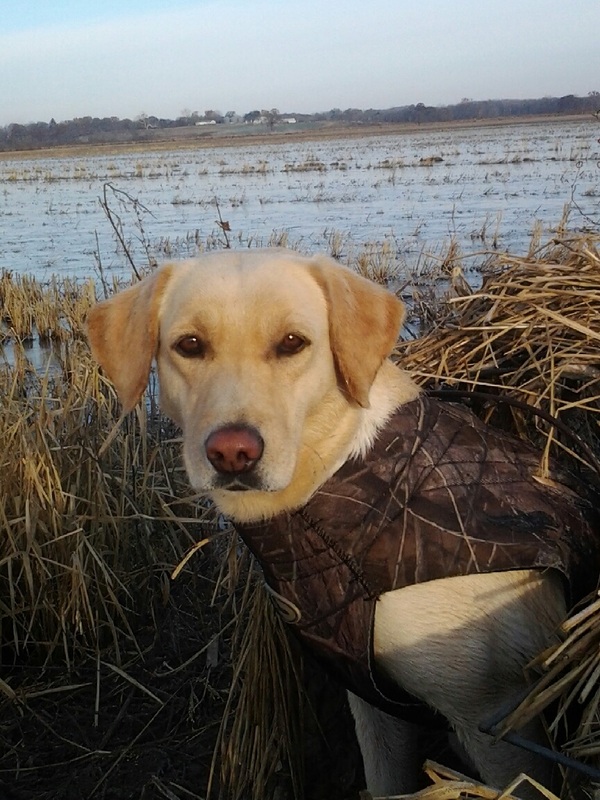 In the fall of 2015, Asia achieved her Hunting Retriever title. She has been trained with no e-collar or traditional force fetch, proving that it most certianly can be done, with the right dog and trainer. Mattye is a take-charge kind of girl. She's bold, confident, and is always ready to go. We acquired her as a year-old pup, and have spent the next year getting her up to speed for both hunt test and hunting situations. Mattye went four for four in the HRC Seasoned stake. She's begun training for Finished, and we're looking forward to her first hunting season in the fall of 2016. Mattye has a reputation for producing tough, driven pup's that excel in both hunting and hunt test scenarios. We're proud to have her as a keystone piece in our breeding program. Carly is an Indie-bred pup, whelped on December 10th, 2015. While extremely biddable, her prey-drive is incredibly high. She is sleek and stylish, with an outstanding thick coat. Her water attitude is excellent, and she hunts extremely hard. Getting the bird is definately Carly's top priority! Carly passed her first Started tests in October of 2016 with flying colors, and has already begun her pick-up career at Arrowhead Lodge. 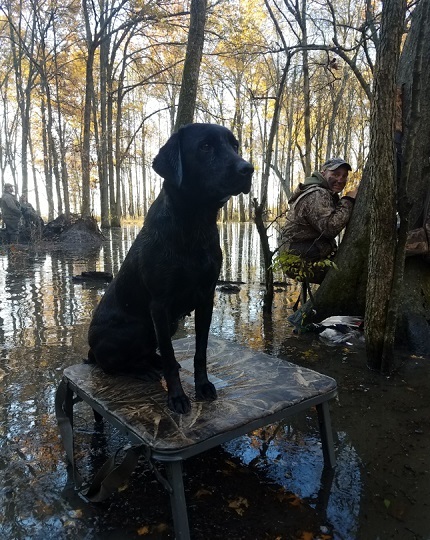 In the spring of 2018, Carly passed four straight Seasoned tests to earn her Hunting Retriever title. She joins three of her littermates with a minimum of a Seasoned title. Barbie was whelped in May of 2018, out of our second Simon x Mattye breeding. After training several pups from the first breeding, we knew we had to keep a female for ourselves from the second litter. Extremely driven and athletic, Barbie is one of those dogs that immediately catches your eye during a training session. We also love her thick coat, natural retrieving instinct, intelligence, and biddable temperment. 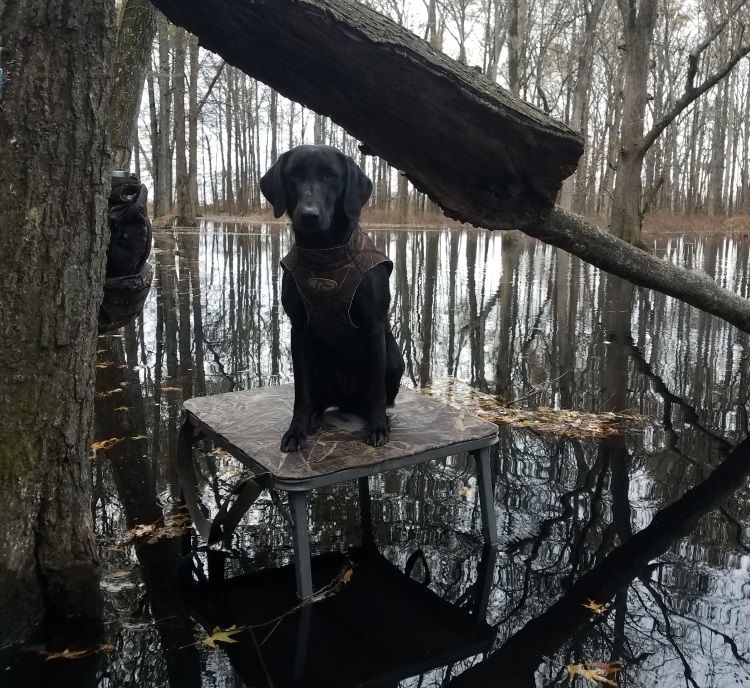 She'll begin her hunt test career in the spring of 2019, and we're excited to see how far this girl can go.